"Runners and walkers alike will enjoy the beautiful scenery of the Greenbelt near Aubrey. With plenty of parking, vendor area and large restrooms, visitors will enjoy a spring morning of walking and shopping. There is a $25 runner entry fee for the timed 5k and walking is free. Learn more or register at laceemup.org. This event benefits Woman to Woman Pregnancy Resource Center of Denton. For more information about this faith-based non-profit, visit friendsofdentonprc.org." Booths are a 6' table and 2 chairs per vendor space. Vendor spaces are free, but you need to reserve your space. Please contact Tammy at tammy@dentonprc.org / 940-383-3150 x303 to reserve your spot. For more information, visit their website or contact Tammy at tammy@dentonprc.org / 940-383-3150 x303. One Stop Shop for your Mother's Day gifts! Indoor Event 25 Vendors with amazing gifts to show your Mom you luh her! Food & Drinks FUN GUARANTEED! Make it a day with mom, or come with friends and keep the keep a secret till Mother's Day. No need to just shop for mom.... treat yourself!" "Vendors will be displaying their crafts! You will find an assortment of; gift items, Knit and Hand-Sewn items, Handcrafted Handmade Items, Handmade Jewelry, Scentsy, And Much Much More!" "Harbors Outdoor Living and Home Expo will feature vendors related to the home, inside or out as well as activity related items. This show could include, patio builders, nurseries, furniture inside and out, gardening items, gift items for the home, also we could do boats, motorcycles, atv’s, camping, etc…"
"Arts & Crafts and Parking Lot Sale! All space rental benefits WPPC Youth Mission Fund. Fun for all ages!! Bounce House and Face Painting (10-12). Refreshments." "Great place to get your Mother's Day Gifts. Also, anyone that comes by will have a chance to win door prizes. Possible prizes include many different items such as Mary Kay, It Works, Purses, and a great deal more, Over 20 door prizes. See you there." "The Titan Treasures Holiday Market will be held on Saturday, October 11 from 9 am - 5 pm and Sunday, October 12 from 12 pm to 5 pm. Artisans and vendors will be selling seasonal items, gourmet food items, jewelry, apparel and accessories and unique gifts of all kinds." 6’ Rectangle Table - $20, Chairs Free. Applications are available here and are due by May 01, 2014. For more information, visit their website, facebook page, or contact their event coordinator at waysandmeans@planoacademyptsa.org. "Over 90 booths of every type of craft and gift imaginable. We have many unique handmade items. Come out to do your Christmas shopping while supporting a great cause. All proceeds benefit Waxahachie High School's Student in Need/ Sunshine Fund. " Booths are 10 feet across by 8 feet deep and cost $70. Electricity is available for $10. Applications are available here and are due by September 1st, 2014. For more information, view their letter or contact their event coordinator at kimkrie@aol.com / 214-463-5101. "A unique blend of original arts/craft, unique gifts & product lines, edibles and more :) Approx. 150 booths indoor. Free parking!!! Admission, $8 per person, kids 12 & under free w/paid adult." Admission Fee: $8 per person, kids 12 & under free w/paid adult. Booths are 10 X 10 and cost $75. Each booth includes one 8 ft table and two chairs. Electricity is limited to booths on the perimeter of the show floor. Applications are available here and are due by November 01, 2014. 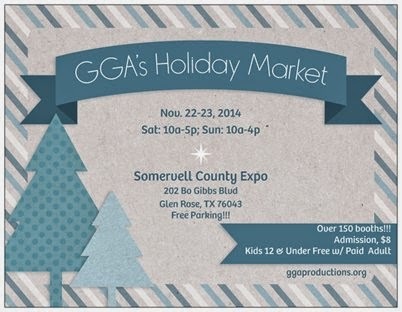 For more information, visit their website or contact their event coordinator at info@ggaproductions.org / 817 659 9249. 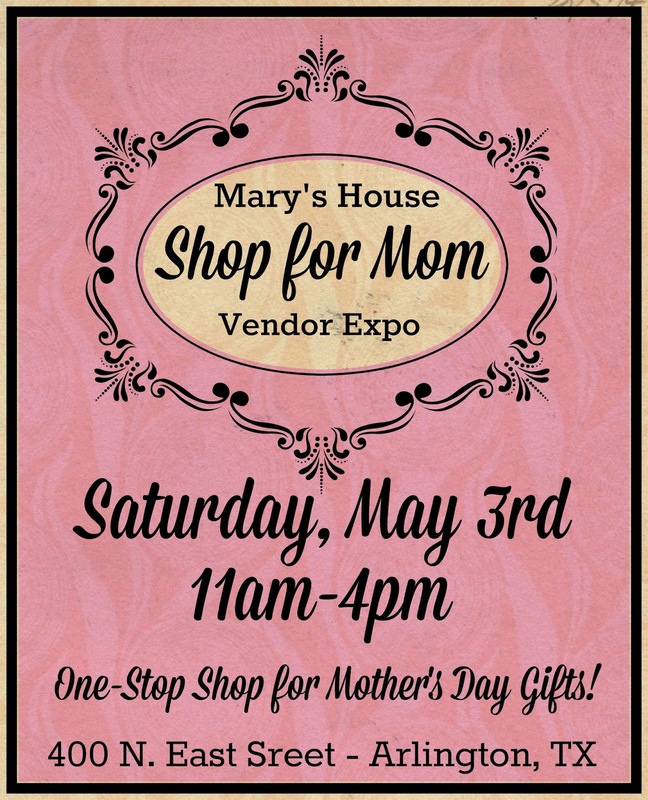 "Come Shop over 60 Vendors just in time for Mother's Day! Free Door Prizes every 30 minutes. Come shop unique, original, hand crafted, one of a kind! Anything from garden, repurposed, recycled, furniture, jewelry, handmade soaps, bath & kitchen goods, home décor, photography, art, jams, jellies and so much more!!!" "Spring Arts & Craft Show in the Park. Over 50 arts and crafts vendors, kids' activities, food and entertainment. Shop from 12:00pm-6:00pm. Street Dance from 7pm-10pm. " "An event for the whole family. Lots of games and rides for the kids. And vendors for all your shopping needs. There will be a silent auction that will benefit the school. Tons of YUMMY food to enjoy as well. It will be a night the whole family can enjoy! " "This Is the Ladies' Night Out event you do not want to miss! 21+ only. Enjoy shopping from 25 vendors, free samples, Swag Bags, cocktails/wine, other drinks, appetizers, pampering, and more!" Admission Fee: Early Bird Promotion til 12/31 Tickets are only $2.50-$7.00 depending on option chosen. "The 2014 Southwest Birth Roundup Moms and Babies Fair is a collection of Fort Worth's best vendors. Everything from Jewelry to Natural Parenting and more. Proceeds benefit the Tarrant County Birth Network and the North Texas Birth Networks, chapters of the 501c3 BirthNetwork National." "Unity Park, Highland Village, TX is THE place to be --Balloon ascensions, Glows, Races, & tethered balloon rides on Fri, Sat, Sun. Additional events on Sat 5K/1K fun runs, Classic Car Show - over 100 cars - & vision screening FREE for adults & children. Additional event on Sun is Wiener Dog Races. Carnival rides, kid zone, activities for all ages, food vendors, arts & crafts booths, llive entertainment, music & MORE. Very family friendly event. Admission free, $5 parking donation requested." 2 1/2 mi west of I35 east on FM 407 & Briarhill Blvd. Booth fees are 10 X 10 and cost $175+. Vendor provides pop up tent & all set up materials - tables, chairs, etc. FREE electricity. Overnight security on sight. Applications are available here and are due by August 01, 2014. For more information, visit their website or contact their event coordinator, Ken, at dk.ashmore@gmail.com / 972-317-9073 or 214-502-6802. Refreshments available for donation. Round or rectangular tables available for rental at $10. Chairs $5. Restrooms available. Applications are available here and are due by April 29, 2014. For more information, visit their website or contact their event coordinator at office@westplanopresbyterian.org / bettyw@westplanopresbyterian.org / 9725962415. "The Market is a producer-only farmer’s market and handmade art market. Every Saturday, visitors gather to see the best Denton has to offer in local produce, handmade items, live music, food vendors, kids activities, community groups and more! A family-friendly festival every weekend at the Denton County Historical Park, 317 W. Mulberry in Denton"
corner of Carroll Blvd (Fort Worth Dr) and Mulberry St.
Booths are 10 X 10 and cost $11 / market day. Membership is a seasonal one time $90 fee. For more information, visit their website or contact their event coordinator at info@dentonmarket.org / vendorcoordinator@dentonmarket.org. Booths are 10 X 10 and cost $75. Vendors required to bring own table, chairs and canopy. Lunch is not provided, but food vendors will be on site. Electricity available. Applications are available here and early registration has been extended to April 23rd, 2014. "One day event. Venue holding up to 70 inside 10x10 booth vendors and 25 10x10 outside booth vendors. April is our Easter Show. Photographer on hand for Bunny pictures. Bounce house weather permitting as well as barrel train for the kids. Prize egg hunt for the customers with the lucky winner winning $100." "Come and support your local community. There will be a variety of handmade, and direct sales. Free to the public. Need to get some goody baskets for the Easter Bunny? We have your one stop shop." "Join us on Saturday, April 19th, for our Spring Craft Show. There will be many vendors and a bake sale to help raise funds for our church's mission trip to Guadalajara, Mexico. ADMISSION IS FREE! You will have the opportunity to purchase raffle tickets for the items that will be given away. " "Come join us for our Parents Defeating Autism’s annual “Stepping Up For Autism” 1k/5k walk (or run) fundraiser at Bess Race Elementary in Crowley, Texas(537 South Heights~Crowley, TX 76036). This event is packed with all sorts of fun and games and shopping for our families looking to support our local Autism community. You don’t want to miss out on this one!" "Free vendor and craft show benefiting the Arlington Humane Society and Stepping Stones. We will have a raffle with drawings throughout the day. " All vendor booths are BOOKED. For more information, contact their event coordinator at mhay99@hotmail.com. "Come shop for Mother's Day or Graduation gifts at the PSSA Spring Craft & Vendor Fair being held at El Centro College in downtown Dallas." Applications are available here and are due by April 30, 2014. For more information, contact their event coordinator at kerrismith@dcccd.edu / 214-860-2170. "Funky Junk Roundup is a one day shopping extravaganza featuring a unique blend of handmade arts & crafts, vintage finds & inspiration, one of a kind items, antique décor, rusty-chippy-shabby-reloved & refunked junk, bling & glam boutiques, sparkly jewels and fabulous junktiques for your creative soul! Put some junk in your trunk Y’all!" Applications are available here and are due by June 21st 2014. For more information, visit their website or contact their event coordinator at montagefestivals@earthlink.net / 405-596-1687. "This event will feature the Tree Lighting, Santa Clause, activities for the kids as well as Holiday shoppers looking for the right gift to give. " Booths are 10 X 10 and cost $100.00. Applications are available here and are due by November 15, 2014. For more information, visit their website or contact their event coordinator at JacqueEventSpecialist@gmail.com. "Craftapalooza and Fabulous Vintage Market is a one day shopping extravaganza featuring an eclectic blend of handcrafted items, artisan designs, bling & glam boutiques, antique & vintage bliss, sparkly jewels, home décor & inspiration, repurposed & funky junk along with fabulous finds for your creative soul!" Applications are available here and are due by July 12th, 2014. "Love to shop with friends? Shop the Ninth Street Market and support a Small Business! Shop now for Easter, Spring Birthdays and Mother's Day! Or buy yourself a well-deserved gift (you know you want to!)" All vendor booths are BOOKED for this event. For more information, visit their website or contact their event coordinator at camicam0402@yahoo.com / 214-587-0169. "This event will feature the Tree Lighting, Santa Clause, activities for the kids as well as Holiday shoppers looking for the right gift to give." Applications are available here and are due by November 8, 2014. Applications are available here and are due by June 7th, 2014. For more information, visit their website or contact their event coordinator at montagefestivals@earthlink.net. "This show would kick off the Holiday shopping season, look for those gift items that people would buy for Holiday gifts. Live entertainment, Mr & Mrs Clause, Tree Lighting." Booths are 10 X 10 and cost $100. Applications are available here and are due by April 12, 2014. They do not overbook the same type of vendor, so please remit an application to insure your product type. For more information, visit their website or contact their event coordinator at canavendorsday@att.net. "April in Edom is an Old Fashioned Street Fair with a popular arts & crafts show as the centerpiece of the event. In addition, the event features live entertainment, a pet parade, a live auction benefitting the local volunteer fire department, children's areas, food vendors, and lots of fun." 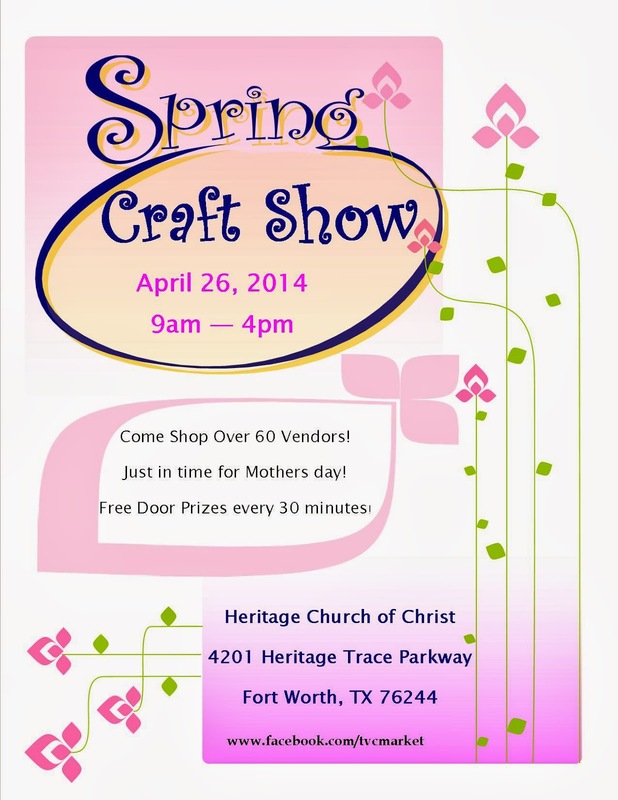 "Come shop a variety of vendors and crafters at Faithbridge Presbyterian Church in Frisco, TX. Admission is free." "Come spend a day in the fresh country air and shop with some of the most unique and creative vendors around. Don't miss the special section of Etsy shops with incredible handmade items that you just won't see anywhere else. Free admission and parking." Early Bird Shopping Passes are available for $10. Come shop while the vendors are setting up and get first shot at finding your treasure. "Join us for our monthly Sip n Shop event held at Forney Salon Suites. Sip on some complimentary adult beverages and shop with local vendors and small businesses. There will be jewelry, handmade home decor, purses, candles and clothing. " Located behind Starbucks and next to Cristina's Mexican restaurant. Look for signs by the roads. Booths are a 6ft table and cost $35. Tables & Chairs provided if you don't have your own. Applications are available here and are due by April 28th, 2014. For more information, visit their website, facebook page, or contact their event coordinator at robin@hotironpromos.com / 817-889-7937. "Grassroots craft show fundraiser for the HOA Social Committee. We will have lots of handmade items and direct sales companies available for you to purchase your favorite products or try something new. Please join us, bring a friend and help us make our neighborhood, Chadwick Farms, the best place to live in Roanoke!" "Join us on Saturday, April 5th, for our Spring Craft Show, sponsored by the PTSA of Lewisville High School. Come shop at over 40 booths featuring Origami Owl, wooden crafts, jewelry, candles, faith gear, variety of crosses, totes, quilts, art, crocheted items and much more. ADMISSION IS FREE!" "The Wallace Spring Market in Lake Highlands is just around the corner! Mark your calendars for great shopping!" "Come shop, eat and have fun at our annual Spring Fair of West Plano family event! Outside, kids will have fun experiencing a children's petting zoo, rock climbing wall, bounce house and other kid-friendly attractions. Parents will love buying their spring flowers and learning gardening tips at our spring flower sale! Numerous flats and bowls will several types of flowers will be available for purchase. Inside, come shop and find your favorite new item at our shopping bazaar! Numerous booths will contain a variety of high-quality items such as: jewelry, clothing, kids personalized items, stationery, giftware, kitchen necessities, travel & organization must-haves, plus much more!" Admission is FREE! Tickets for food, rides and games can be purchased during the event.